Krazy Joe is joined by the Godfather of podcasting, Michael R. Mennenga!! Mike is the host of Slice of SciFi, Dragonpage, Romy Nelson: Ingredients for Life and just about every other podcast ever known to man! Today Mike & Krazy Joe discuss Brandon Routh in 'Dylan Dog: Dead of Night', Marvel Comics' 'Thor', and react to the news that Arnold Schwarzenegger has agreed to star in 'Terminator 5'. Mike & Krazy Joe then go on to deliver some crisp, manly high fives to 'Scream 4', the 6th season premiere of 'Doctor Who', James Gunn's 'Super', and HBO's 'Game of Thrones'. Krazy Joe also praises NBC's 'Community' for their hilarious commentary on the recently cancelled series, 'The Cape', in a recent episode. All this, and listener voicemails, too!!! On the weekend of Friday April 29th through Sunday May 1st, you can meet MegaPodzilla's Dave Perillo in artist's ally at the Boston Comic Con! Stop by and see Dave if you're in Beantown...and remember to wear your MegaPodzilla underwear for a free sketch! This episode of MegaPodzilla is brought to you by Weforia! Sign up athttp://signup.weforia.com/ to earn 50% to 90% off on local deal in your area! Use Krazy Joe's last name, Fiore, as your sign up code! MegaPodzilla # 32: Bringing Home the Bacon Ice Cream Sunday! Krazy Joe is once again joined by Indiana Jones expert, James Clark! In the Prediction Network, Krazy Joe predicts a season 5 renewal for NBC's 'Chuck' based on a recent tweet by series star, Zachary Levi. James and Joe also discuss the upcoming season 6 of BBC's 'Doctor Who', the new trailers for 'Rise of the Planet of the Apes' and 'Apollo 18', 'Hobo with a Shotgun', and 'Scre4m'. In the High Five segment, Joe & James heap out the praise for Zack Snyder's 'Sucker Punch', T.I.F.R. 's Bacon Bazooka, the season finale of BBC's 'Being Human', and celebrate the fact that Disney has given a greenlight to 'Tron 3'. James also geeks out over the new 'Mortal Kombat' webseries starring Michael Jai White and Jeri Ryan. The Damage Report scolds the China State Administration for Radio, Film and Television for it's recent decision to ban movies and TV shows about Time Travel. Krazy Joe goes on yet another DC Comics inspired anti-Reboot rant (check out MegaPodzilla #29 for Joe's previous reboot rant) regarding Zack Snyder's upcoming 'Man of Steel', and Warner Bros newly announced 'Justice League' movie. James discusses the living hell that is his wife's obsession with a TV show called 'Make it or Break it', and Denny's brand new Bacon Ice Cream Sunday. Also, James issues a challenge to MegaPodzilla's Dave Perillo --- will Dave actually try the Bacon Ice Cream Sunday?? This episode of MegaPodzilla is brought to you by Weforia! Sign up at http://signup.weforia.com/ to earn 50% to 90% off on local deal in your area! Use Krazy Joe's last name, Fiore, as your sign up code! 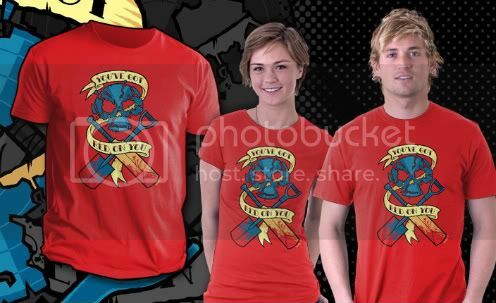 Like all shirts at TeeFury.com, this will be available for only 24 hours, so pick yours up on Tuesday 4/26/11! A fan letter from Vgj Wup!! 1) Yes, I will send you an autographed e-mail of me naked on the bearskin rug. 2) No, sorry...Dave is indeed married. But he appreciates the compliment! 4) Everyday, but I only use the backscratcher in extreme circumstances. 5) Easily 2001's 'Freddy Got Fingered starring Tom Green. But you're right...it's a tough choice! I might also go with Casablanca! 6) One time, but I was really drunk off Blue Hawiians. It's not a day I'm proud of. Thanks again for writing, Vgj! And to all our listeners, remember to send your e-mail to MegaPodzilla@yahoo.com!